Olkiramatian, Kenya, Dec 7 2015 (IPS) - This market centre in the arid Lake Magadi region, Kajiado of Southern Kenya is with no grid electricity. The area is inhabited by the pastoralist Maasai community. With climate change affecting their pastoral way of life, the community is increasingly adopting a more sedentary life but without amenities. The centre is hot and dusty. Much as the area enjoys bright sunshine during the day, the situation changes to pitch dark after sunset. But in the last two years, the market centre is witnessing a transformation. It is becoming a beehive of activity. 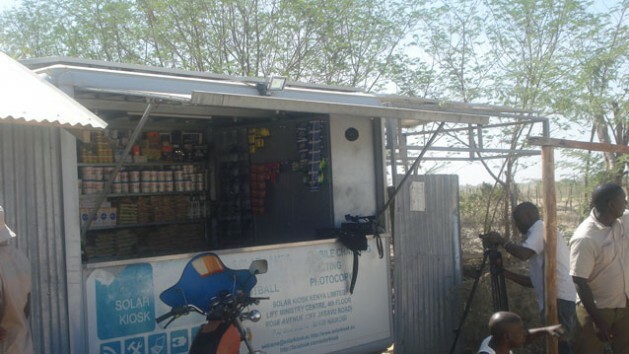 This is courtesy of Solar Kiosk Kenya Ltd. that installed a retail kiosk, called the SOLARKIOSK E-HUBB. The E-HUBB, designed by GRAFT (partners and co-founders of SOLARKIOSK AG, the Berlin-based mother company), is a modular solar-powered structure that can be easily implemented in remote communities. The E-HUBB outlet enables and empowers local entrepreneurship and the sustainable development of Base-of-the-Pyramid (BOP) communities by selling essential food ingredients, vital energy services, solar and clean energy products and connectivity solutions. By the end of 2015, SOLARKIOSK will have implemented over 100 E-HUBBs on three continents. A SOLARKIOSK E-HUBB is a solar-powered autonomous business hub. It uses solar power to generate electricity for rural off-grid communities for various uses. It is a decentralised, easy to maintain source of energy. Kiosk operators are able to use the power during the day and continue operating late into the night. Solar Kiosk Kenya Ltd manages operations in Kenya and uses a business model that enables a local entrepreneur to sell solar products and provide solar powered services to their community. It is a commercial enterprise which stations solar-powered units in kiosks in Kenya’s remote and peri-urban areas, thus creating a triple impact: social, environmental and economical. Its impact amplifies the link between energy and development. To the residents of Olkiramatian the dream of ever accessing a clean source of energy was just a farfetched one to the residents. Like elsewhere in remote areas of Kenya, Olkiramatian residents rely on kerosene lanterns or diesel generators which are not only noisy but also polluting. “The E-HUBB combines a state of the art design with a total of 2Kilowattsolar panel capacity on the roof as well as enough battery capacity to operate for at least 24 hours without sunshine,” he said. The SOLARKIOSK impact on residents of Olkiramatian is noticeable. Seuri Lesino, the SOLARKIOSK operator at Olkiramatian says that he opens his E-HUBB for a few more hours at night generating extra revenue for the family. “Initially, to run a business here after sunset you had to rely on kerosene lanterns which could hardly provide enough light, but nowadays if you come at night, you will be mistaken to think that you are in a town. We operate till midnight and residents have come to like it, the power is abundant,” said Seuri. “The2kw E-HUBBin Olkiramatian installed in 2013 generates electricity capable of powering a television set, printing services, document lamination, and phone charging, barber and photocopy services,” he said. In addition to energy services and food staples, the E-HUBB sells a wide range of solar products as well as energy efficient cook stoves, farm waste charcoal briquettes and other sustainable goods. Van Willem says that the kiosks are also equipped with internet services in addition to being a platform for businesses like beauty salons, hairdressers, movie and sports viewing halls. “In the future, we can expand this E-HUBB into its own mini mall, if another entrepreneur comes around with the aim of offering butchery services for instance, additional panels can be provided and this applies to service providers like telecommunication companies keen to put up network masts,” Jan Willem explained. Area Chief Josphat Maiponyi says that SOLARKIOSK has enabled availability of services and products that initially were not previously accessible. They include cold drinks and perishable products that are now present courtesy of refrigeration services. “Harnessing of this free and abundant sunshine has borne dividends,” he said. He adds that residents used to move long distances to charge their phones but it is no longer the case. Maiponyi says that the elders use a temporary hall set up close to the kiosk to conduct their meetings even after sunset. Fredrick Sankori, a primary school pupil from the neighbourhood says he finds the hall handy to his school homework late in the evening, taking advantage of the light provided and not being effected by the bad smoke of the kerosene candles. SOLARKIOSK spurs local development by enhancing communication and entrepreneurship, offering a safe place to the residents to meet their friends. The kiosks are assembled in Kenya with the parts being brought in from Germany. Soon the kiosks will also be manufactured locally in Kenya. Currently, there are 23 SOLARKIOSK E-HUBBsin Kenya offering not only services to thousands of Kenyan but also employment to many local people. SOLARKIOSK AG is operating also in Ethiopia, Tanzania, Rwanda, Botswana and Ghana. The United Nations Environment Programme (UNEP) Lighting Assessment undertaken in 2010 indicated that the off-grid population in Kenya was 34 million out of the country’s population 40.5 million people. This may slightly increased but indicates the need for efficient off grid systems particularly in rural areas. Globally 1.5 billion people live without electricity access. Some 800 million are in Africa. Unsustainable and dirty fuels provide much of their energy despite abundant sunshine. Fortunately, off-grid communities like Olkiramatian can benefit from the immense solar resources of the African continent and access sustainable energy. The outcome is a significant change in livelihood. According to the World Bank, Kenya has an estimated solar radiation potential of at 4-6 kWh/m2/day, which can effectively end energy poverty if optimally harnessed. Jan Willem’s concern is however that poor transport network and general infrastructure in rural Kenya could undermine investment in providing more SOLARKIOSK E-HUBBs as off grid energy solutions. “There hasn’t been much goodwill from authorities, we would welcome any support from the government,” he said. He suggests that if the kiosks are embraced by local governments, they can open up rural market centres to spur entrepreneurship and economic development through the provision of affordable, reliable and clean energy. Similar views are expressed by Peter George, Global Village Energy Partnership’s (GVEP) Head of Advisory Services who says that infrastructure is a challenge to renewable energy companies targeting remote communities. GVEP is involved in initiatives to reduce poverty and increase energy access in Kenya. George says investment in renewable energy is vital because it conserves the environment and creates jobs. “Tangible and real development can only occur through sustained and enough energy generation in country.” he said. He adds that the more widespread the energy access, the easier it is for a country to tackle poverty. “It is for this reason that we’re supporting companies like SOLARKIOSK who invest in the provision of energy to off grid communities,” he said.